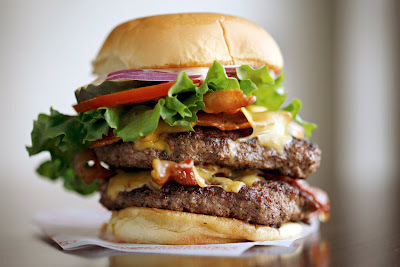 The Farmhouse bacon cheeseburger from The Good Stuff Cookbook. As I mentioned this morning, Spike Mendelsohn's new book, The Good Stuff Cookbook, hits shelves at the end of this month, and you can enter to win a copy by commenting on the previous post. For a little sneak peek of what's in the book (and just in time for Memorial Day cooking! ), check out this recipe for the Farmhouse bacon cheeseburger, courtesy of Wiley Paperback. What can make the All-American burger better? Its simple—add cheese, add bacon. To make the patties, roll six 5-ounce sirloin balls, and form each ball into a patty. Arrange on a tray, cover, and refrigerate. Line a plate with paper towels. Heat a large skillet over medium-high heat, and add just enough oil to cover the entire bottom. When the oil begins to smoke, add the bacon and cook until crisp. Remove with a slotted spoon. Drain on the paper towels. Drain off the fat from the skillet but do not wipe clean. Reduce the heat to medium and place the patties into the same skillet. Season the patties with salt and pepper and cook for 3 minutes. Flip, and cook on the other side for 1 minute. Place 3 strips of bacon and 1 slice of the cheese on each patty and continue to cook 2 minutes more for medium-rare doneness. Cover with a lid for the last 30 seconds to melt the cheese. Toast the buns. Set aside. To assemble the burgers, place 1 patty on 1 toasted bun bottom. Top the patty with 1 lettuce leaf, 1 tomato slice, 1 onion slice, and 2 pickle slices. Dress with some of the sauce. Cover with the bun top. Repeat with the remaining ingredients. Don’t forget to wrap the sandwiches in wax paper. Let rest for 2 to 3 minutes and serve. After reading several books and articles on Americans and the hamburgers they love, my mother found that people’s favorite sauces were different takes on Thousand Island dressing (ketchup and mayo). At one of our family tastings, Mike Colletti, a chef I met at Le Cirque, and I came up with our twist on it—we locked ourselves in the kitchen and added a little something to the sauce to give it a real kick. Add the mayonnaise, ketchup, molasses, vinegar, and salt to a food processor or blender. Puree until smooth. The sauce can be refrigerated in an airtight container for up to 1 week. In France, they used to make fun of me about my love of Hellmann’s, but if you ask me, it’s pretty damn good. If you want to go the extra mile, though, it doesn’t get any more basic than this recipe. Add the eggs, mustard, vinegar, and salt to a food processor or blender. Process for 30 seconds in the food processor, or for 10 seconds in the blender. With the motor running, drizzle in the oil slowly at first, then add in a thin, steady stream until all the oil is added and the mixture is smooth. Stop the motor and taste. If the sauce is too thick, thin it with a little hot water. If too thin, process a little longer. The mayonnaise can be refrigerated in an airtight container for up to 1 week. Thanks! My husband is temporarily stationed in Ireland where he's found that ALL mayonnaise is terrible. And, Hellman's purchased in Ireland tastes like Miracle Whip here. After a recent visit to the U.S., he packed a jar of Hellman's before his flight back to Ireland. I'll send him this recipe. Anon - So glad the mayo recipe can help your husband! Knowing how to whip up homemade mayo is a great skill to have in your repertoire.